At the risk of sounding like National Geographic, Namibia is the 34th largest country in the world and has the least rainfall in sub-saharan Africa. Sr Aida Manlucu says that the sheer size of the country is just one of the challenges she faces as director of Caritas Namibia. “There’s a lot of travelling in my job. I get on the road and I drive for hours without seeing anyone. I used to do up to 1000 kilometres alone across Namibia, now I take a companion with me,” she says. Namibia is currently facing its worst drought in 30 years. Almost half of the 2.2 million population has been suffering from hunger. Sr Aida has been spending a lot of time on the road trying to organise the Caritas response. 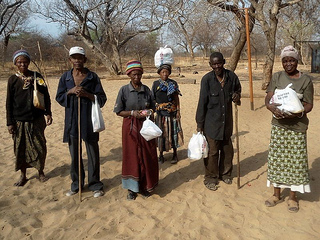 To help people hit by the drought, Caritas Namibia launched its first ever emergency appeal last year. They needed donations of up to US$840,000 (EUR 626,000) to people caught up in the food crisis. They distributed food including beans, oil and sugar, to supplement food given by the government in September and March. The first distribution helped 13,500 households and the second 15,500 households. Leticia Aijambo, 69 years old, is a grandmother who lives in Anamulenge, a town located in the Archdiocese of Windhoek. She looks after her seven grandchildren, for in Namibia it is common practice for parents to leave the children with their parents in the village, while they go and look for work in the big cities. At the height of the crisis, Caritas provided Leticia with an essential foods parcel, including beans, rice, oil and sugar. “Our crops were completely destroyed last summer, and we had nothing to harvest and store. The support provided by Caritas has made a real difference. If the rains continue this year, then we should have a reasonable harvest in June. But if it does not rain enough, the situation will be alarming, “she said. Sr Aida is the only professional member of staff in Caritas Namibia, apart from the secretary general, so they rely heavily on volunteers. Sr Aida is a Maryknoll sister. She trained in chemical engineering in the Philippines, where she was born, and worked for many years in Latin America. She’s worked in Namibia since 1997. Sr Aida is very determined to promote solidarity in Namibia and help communities become self-reliant. She doesn’t know how long she’ll be able to stay there though.